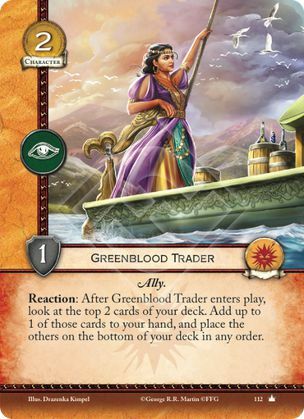 Reaction: After Greenblood Trader enters play, look at the top 2 cards of your deck. Add up to 1 of those cards to your hand, and place the others on the bottom of your deck in any order. Self-Referential Text: When a card’s ability text refers to its own title, it is referring to itself only, and not to other copies (by title) of the card. Therefore, a player with one Greenblood Trader already in play when he marshals a second copy does NOT get to trigger both -- only the one just marshaled.